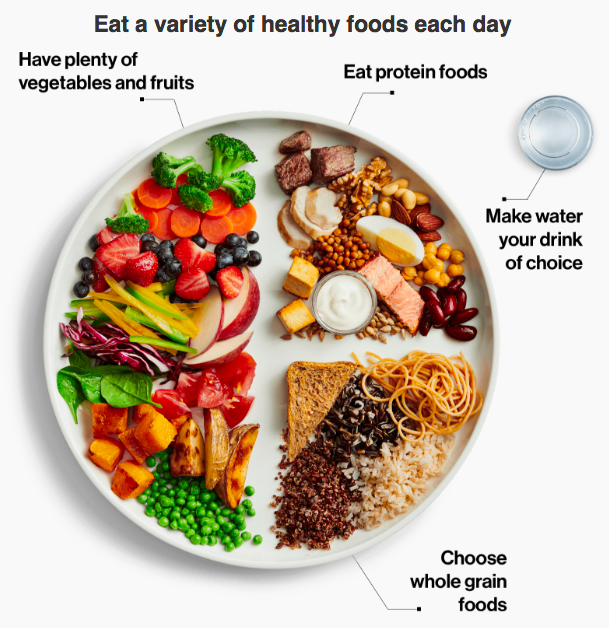 Unless you’re living under a rock, you’ve probably heard the news… Canada’s Food Guide long awaited update has finally been published on January 21st! The reveal took place in Jean-Talon Market, in Montreal, the perfect sport to launch the new food guide which encourages you to increase your consumption of veggies and fruits. Here’s a summary of the new recommendations. 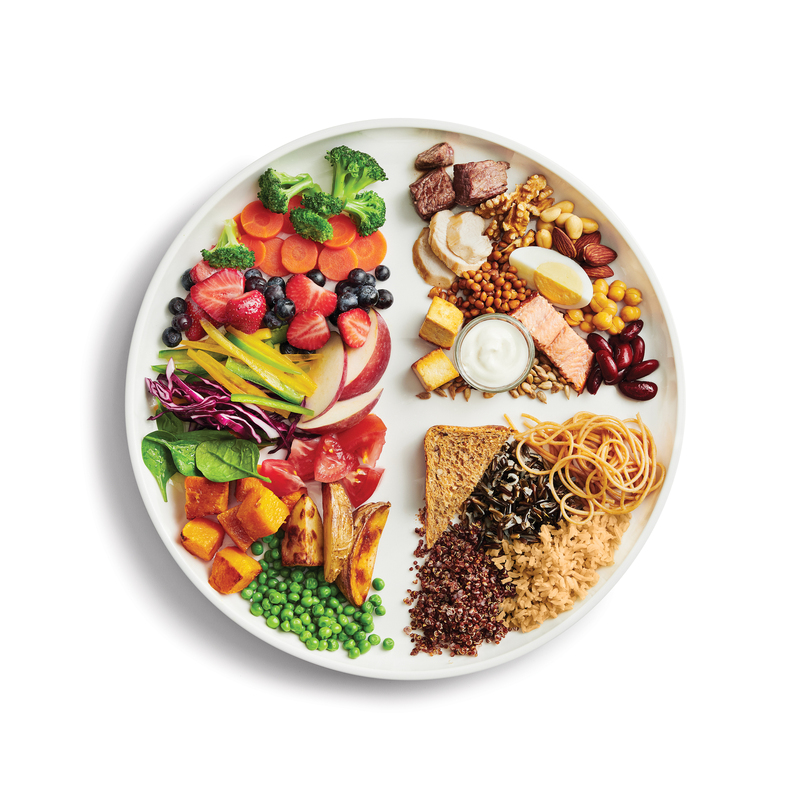 As you can see in the healthy plate, vegetables and fruits take up half of the plate. Did you noticed that vegetables come before fruits? That’s right, you should eat more veggies than fruits. In addition, juices no longer ‘count’ has a portion of fruit or vegetable, great news! It’s time to say goodbye to the ‘milk and alternative’ and ‘meat and alternative’ food groups and their portion size. 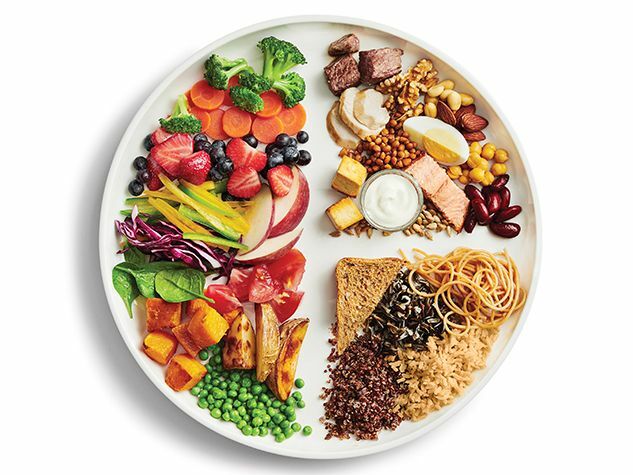 Canada’s food guide now recommends that you have a source of protein with each meal, which should occupy around a quarter of your plate. We’ve been saying it for a few years now, sweetened beverages (flavoured milks, juices, soda, pop, etc.) don’t really have their place in an healthy diet. Water is, by far, the best way to keep hydrated. You should prioritize whole grains because they contain more fibre, vitamins and minerals than their non-whole grain counterparts. These nutrients have been linked to reduced risks of several diseases like cancer, diabetes and heart diseases. You may have also noticed that the food guide no longer suggests a number of portions of each food group to have each day… We now recommend that you eat to satisfy your hunger, while keeping in mind the suggested proportions. This recommendation basically encourages you to decrease as much as possible your consumption of highly-processed foods and replace them with basic foods. For example, instead of buying a frozen pizza, you can make your own using a whole grain tortilla, a little bit of tomato purée and toppings of your choosing. It shouldn’t take much longer to make, and it is so much better for you! 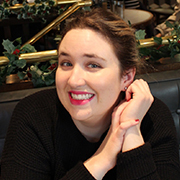 The famous saying ‘If it looks too good to be true, it probably is’ is still relevant to our era of social media and ‘nutrition experts’ of all kinds! Dietitians are the only experts in nutrition. In summary, the new food guide is a big step in the right direction! Do you have questions, comments or opinions about the new Food Guide? Let us know in the comments section below! « How to Make Sure You’re Promoting Sustainable Fishing?